Home Tokyo Metropolis Central Tokyo Your last chance to pay homage to the Tsukiji Fish Market! Without a doubt, Tokyo’s Tsukiji Fish Market is the largest and most famous fish market on the planet. Paying a visit is like a holy pilgrimage that sushi lovers all over the world dream about. If you want to make that dream come true, it is time to hurry up! 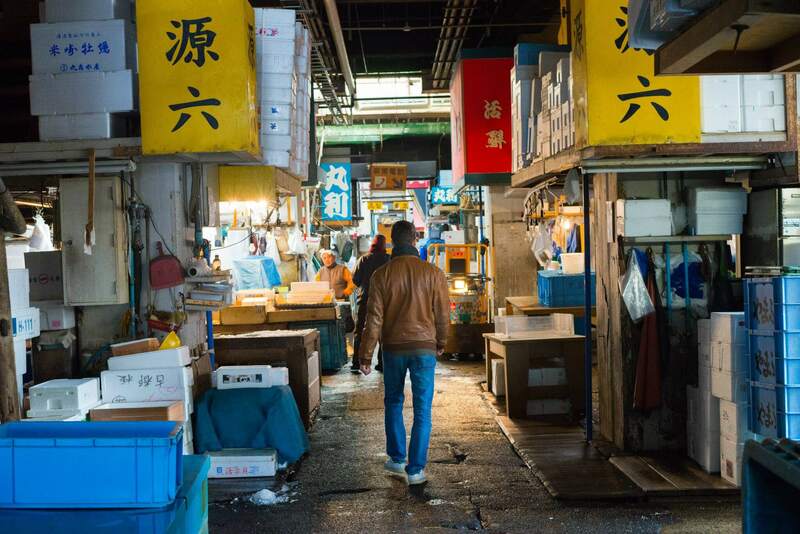 The Tsukiji Fish Market is due to move to a different location in 2016. Yes, you hear that right, this Tokyo landmark that has been around for nearly a century is in its last year of existence. Before it’s too late, WAttention introduces you the best way to experience your first and probably last visit to the Tsukiji Fish Market. As the fresh seafood comes in during the early morning after being hauled by fishermen the night before, waking up early is a must if you want to fully experience the market. Shops for visitors will be open until 1 pm, but the actual market is pretty much finished after 9 am, and the famous tuna auction starts at 5 am. Only the first 120 visitors can observe this auction, so if you want to secure your tuna auction observation, arriving at least 30 minutes before is recommended. The auction hall will be full of gigantic tunas caught the night before. Nothing here is mechanized nor computerized – auctioneers shout the prices with hoarse voices as if they are singing while lightly bending and stretching their knees to the rhythm. The auctioneer is reading out the price of the tuna, but uses special terms even most Japanese won’t understand. The bigger tuna weigh around 220 kilograms, and millions of yen are put on the table for them. The scary thing is that even tuna experts cannot be sure of the fish’s quality before it is cut open, which can only be done once the fish is purchased. There sure is a lot at stake at this auction! One should first understand that the Tsukiji Fish market consists out of the outer part and the inner part. The outer part is open for tourists, and many small restaurants and shops can be enjoyed at ease here. The inner market is where the real business is happening, with motorized trolleys driving around through the busy, narrow paths with stalls that have any fish you can imagine. The inner market is not open for window-shopping, and you will be told that it is forbidden for tourists. However, this is not entirely true. You are allowed to enter as long as you are buying something, so if you say “kaimono” (I’m here to buy), the guards will let you in. As mentioned before, the outer market has lots of restaurants and shops to satisfy your seafood appetite, but true sushi addicts will most appreciate Sushi Dai, a popular sushi shop located in the inner market. Expect to queue even in the early morning, but once you get in, you will soon realize that you have made it to sushi heaven! We recommend the “Trust the chef” menu available for 3,900 yen, which consist out of the freshest fish of the day selected by the chef. The sushi will be put straight on the counter piece by piece. First, check the Tsukiji Fish Market calendar to see if the market is open on the day you plan to visit. The market is closed on Sundays and usually (but not always) on Wednesdays. Be sure to wear the right shoes, as flip flops and high heels are not allowed. Also keep in mind that you might have to wait for a pretty long time (before the tuna auction starts and in case you decide to queue at Sushi Dai) so wear something warm during winter, and take a book or charge your smartphone to 100% to prepare for time killing. The most important thing when visiting the Tsukiji Fish Market, is to be polite and obey the rules. People here are at work, and are not benefiting from your visit. Therefore, it is important that you don’t interrupt or disturb their business. Flash photography is prohibited, especially when observing the tuna auction as the auctioneers might not be able to catch some of the bids because of it. When walking the inner market, give way to the motorized trolleys as they are given priority. If you stand in their way, expect to be pushed aside without any precautions. That being said, as long as you are polite and respect the rules, the people at the Tsukiji Fish Market will treat you friendly, especially if you buy a fish or two!